We have a beautiful litter of KUSA German Shepherds available. They are all very out going and ready to chew on everything in their path. 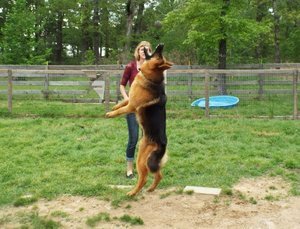 The sire is a V-rated, IPO3 German import out of West German show/working lines and is the epitome of what a German Shepherd should be. The mother has had advanced obedience training as well as training in agility and tracking. Her pedigree goes back to some of the old DDR working lines. Both parents have good hips and elbows, and the sire is DM-clear. Puppies will make excellent pets, companions, protection, service, etc. 1st shots, worming, and veterinary health certificate. KUSA papers. If you are looking for your beautiful, confident, intelligent, red and black forever companion, check out our email.